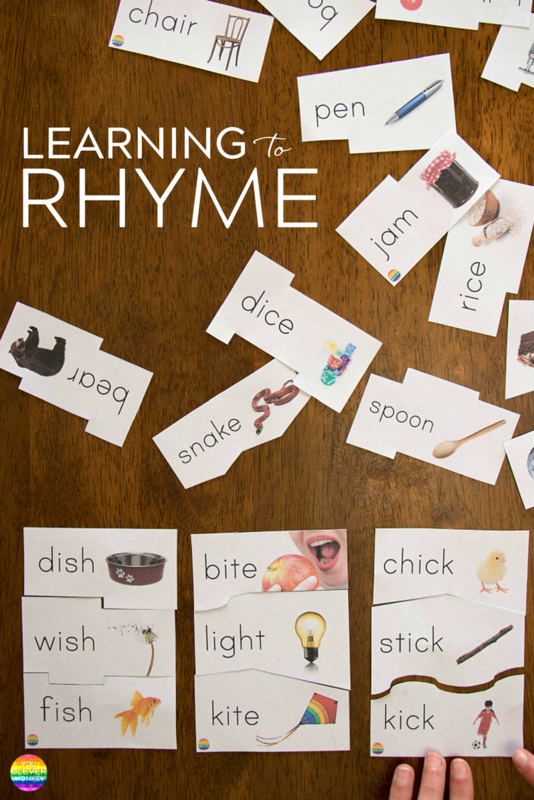 Useful teaching ideas and resources to help teach young children hear and produce rhyme from preschool and beyond. 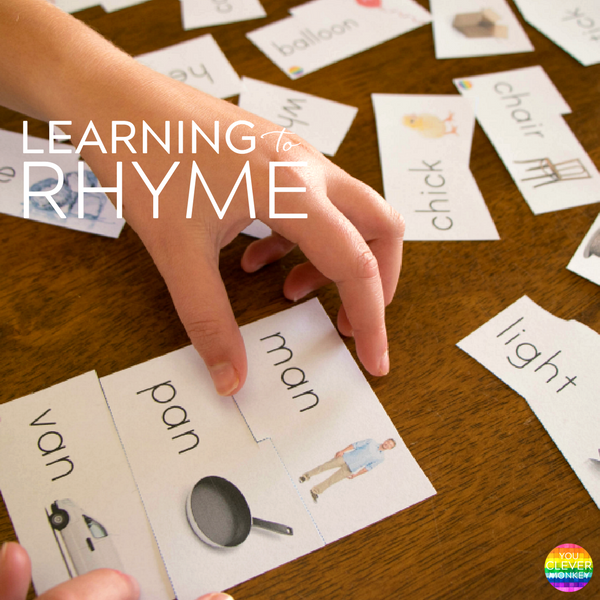 So exactly how important is learning to rhyme? We know that the ability to hear and produce rhyme is predictive of a child's later reading success but being able to rhyme alone is not enough as young children also need other skills to help the become skilled readers and writers later. We know there is continuum for when these skills develop in a child's early years. So how as parents and teachers should we best support the development of these crucial literacy skills? 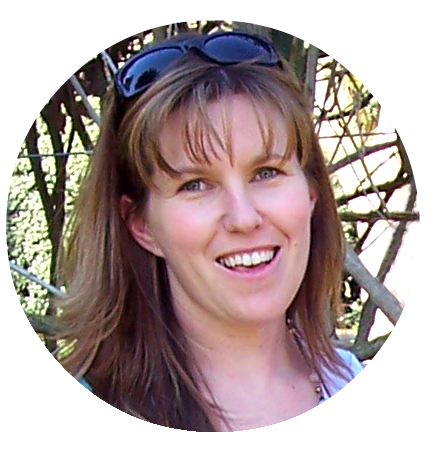 As an Early Years teacher, I know how helping children develop strong phonological awareness skills in the first years in educational settings can strongly influence their reading and writing ability. Phonological awareness is understanding what the sounds (in letters) are and how they work together to make words. Children normally develop their phonological awareness skills between preschool age and the first two years of school. - sound and word discrimination - find the word that matches - does dog or cat rhyme with frog? - phoneme substitution/manipulation - if I change the C in cat with a M, I spell mat. If I change the T in mat with a N, I spell man. If I change the A in man with an E, I spell men. In this first post let's look at how to teach children to recognise and produce rhyme as part of a phonological awareness series. Books. I always start with books. Exposing children to a wide range of different books from birth helps them hear words and patterns in language that they aren't always exposed to in everyday exchanges. 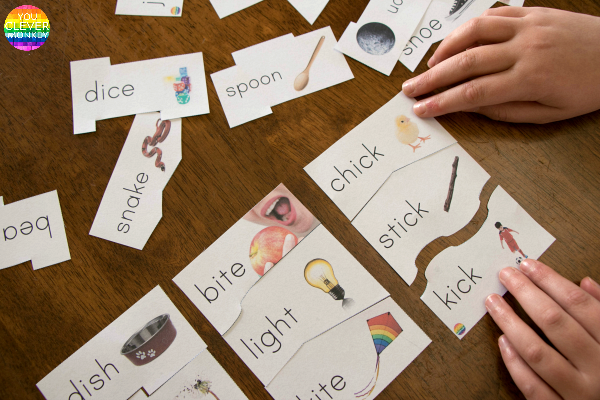 This richness of language helps unlock a child's ability to predict words as they read. Books full of rhyme help teach children how language works. When children are familiar with a nursery rhyme or book with rhyme, they are able to anticipate the rhyming word. 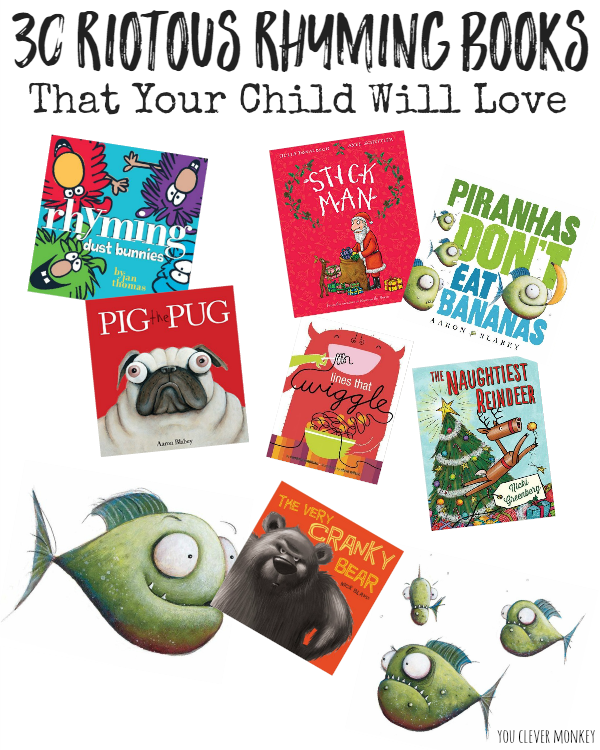 Here is our list of over 30 fabulous rhyming picture books you might want to share with a child. After introducing children to rhyme through books, hands-on activities allow them to practice recognising and then move on to producing their own rhyme. My favourite activity to do first with my class when first introducing rhyme is a rhyming basket. I first saw the idea posted by Anna from The Imagination Tree. 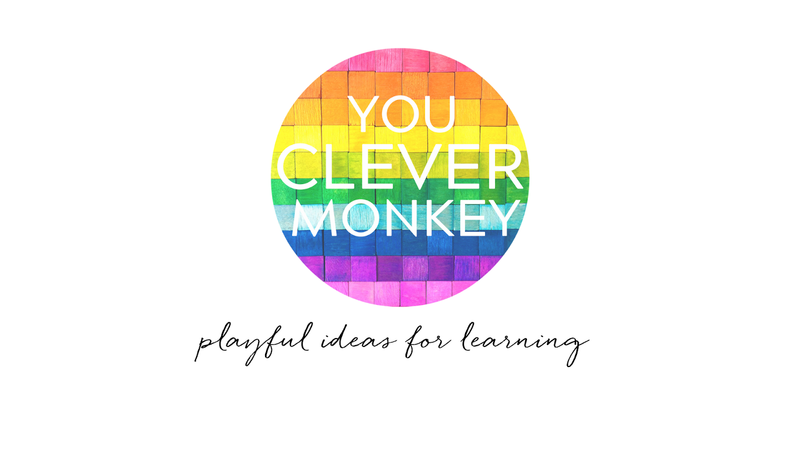 She created this simple game which is easy to replicate at home or in the classroom. 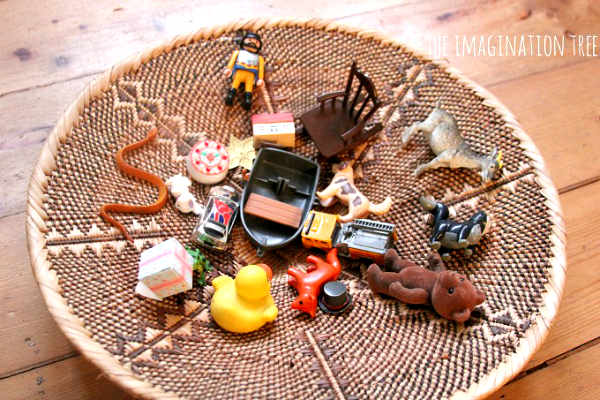 Just collect pairs of objects which rhyme - dog/frog, goat/boat, chair/bear then ask children to try and match the objects together. For preschoolers, start with only 4-5 pairs then work up from there. We then will often have a literacy centre or guided reading activity with a rhyming focus in class. Start simply as with most literacy centres, the children are working independently. 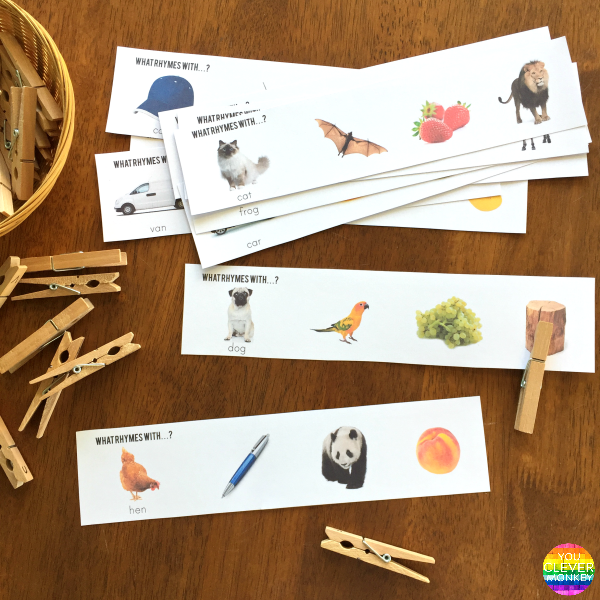 These rhyming word peg cards are a good starting point as they provide children with real life photos as support. After naming the first object, they then just need to identify which out of the three choices rhymes with the object. My students love puzzles so these 3 part rhyming word puzzle cards are always a popular addition to our literacy centre rotations. With 38 different sets that start from simple CVC rhyming words (cat/hat/bat) and also include blends (swing/spring/ring) and digraphs (chick/stick/kick) there's enough cards to create 3-4 smaller sets to allow children to work independently or with a partner to match the rhyming words. You can find these rhyming cards here. We also love to play games in our literacy centres and craft sticks make a cheap and easy to source material to make different rhyming games from. 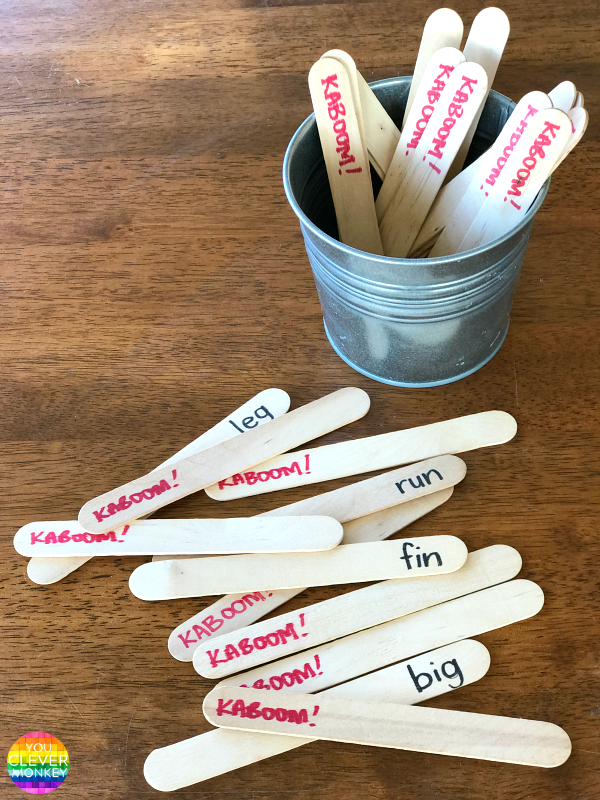 For learning to produce rhyme, this game of KABOOM! is a fun way to practice. The game is simple to make. 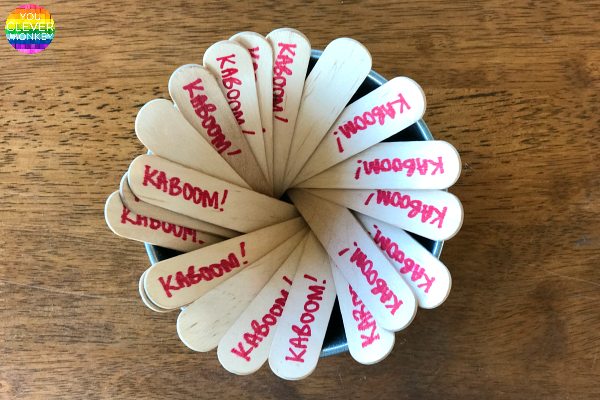 On one end of the craft stick, you write a word to rhyme to and on the other end, the word KABOOM! Place all the sticks in a pot with the word at the bottom. The children take it in turns to pull out a stick, read the word then try to produce a rhyming word. If they can do that successfully, KABOOM! they can keep the stick. If not, the stick is returned to the pot for someone else to try. 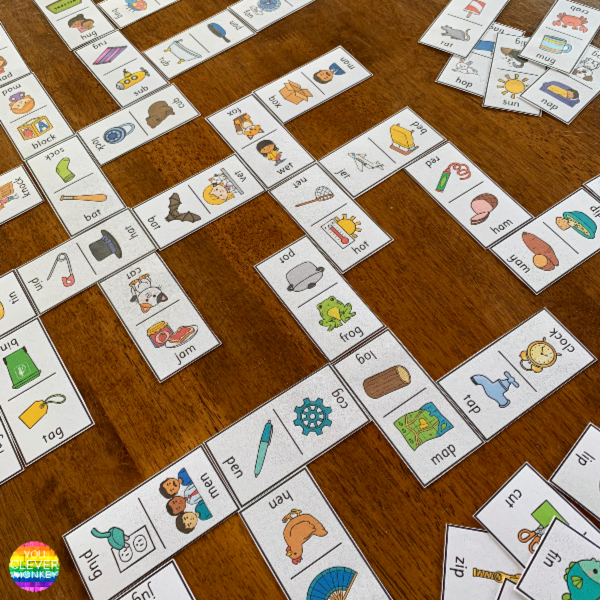 You can start with easy to read, easy to rhyme words then introduce tricky words depending on the ability level of your groups which makes this game a perfect one for allowing differentiation in your classroom. Even lower level reading children will be successful as their peers won't be able to help but try and think aloud of a rhyme for the stick that's pulled out. We've also used craft sticks with CVC words written on them for sorting. Word families are a perfect way for children to begin producing their own rhyme. Looking for more craft stick hacks? You can find more than 50 different ways to use craft sticks for learning in this post. This short vowel domino card game has been another fun hands-on way to practice identifying and producing rhyming words during play. They've proved to be a fun addition to our literacy centre rotations. You can find this domino game here. 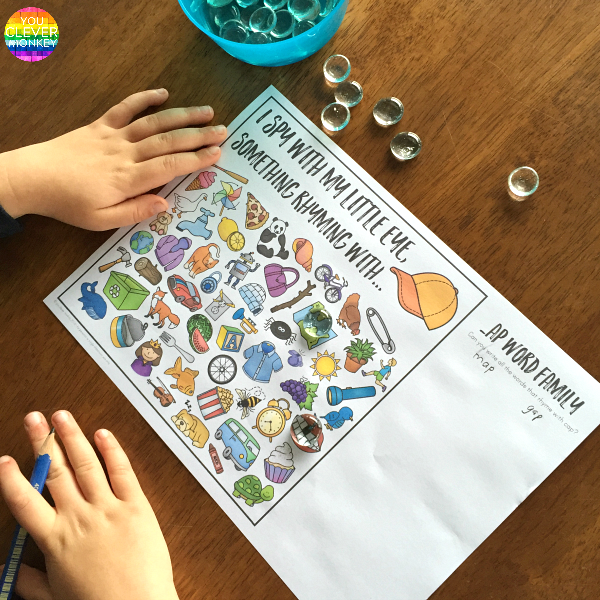 For children who are becoming more confident, you can also try these word family I spy mats. With more words to have to differentiate, they provide more challenge for older children. You can find more I Spy mats here.